Any planned development larger than 40,000 square feet or with a substantial presence on a major thoroughfare will be specifically evaluated on whether its design meets city standards under the new Comprehensive Zoning Ordinance, which New Orleans officials hope to ratify as law by February — after years of planning and public meetings. Any development with more than 100 feet of frontage on certain corridors, including the riverfront (such as the Tchoupitoulas area), “character preservation” corridors (such as Magazine and St. Charles), “enhancement corridors” (including Claiborne, Broad, Carrollton, Oak and Earhart) and “transformation corridors” (which include locations in New Orleans East, Gentilly and the Westbank). Multifamily residential projects with more than seven units on these corridors would also be subject to review. That change is just one of many described by city planners Tuesday evening in a presentation about the new Comprehensive Zoning Ordinance in Central City. Another major shift, for example, is to eliminate “cumulative uses” in the zoning. Currently, a lot may be used in any way permitted by its zoning, or any use considered less intense than its current zoning — commercial uses may be built in industrial zones, for example, or residential uses are allowed in commercial zones. Under the new law, only the uses specified in each zoning district will be allowed. A frequent complaint at City Planning meetings, particularly about projects designated for Magazine Street, is how little parking is required. Businesses under 5,000 square feet are not required to have any parking, and that standard remains the same under the new law, said Leslie Alley, deputy director of the City Planning Commission. On the other hand, the new law does contemplate ways to ameliorate parking pressures on the corridor. For example, the city may create a “fee in lieu of parking” program, in which developers can pay into a specific fund for the development of public parking lots in congested areas, such as the lot on Freret near Napoleon. Many Magazine Street developers would be hamstrung by the need for parking — since the only way to create space for it would be by the demolition of adjacent historic buildings — but the city could facilitate the creation of public lots in strategic areas that are already vacant, such as unused NORA lots. 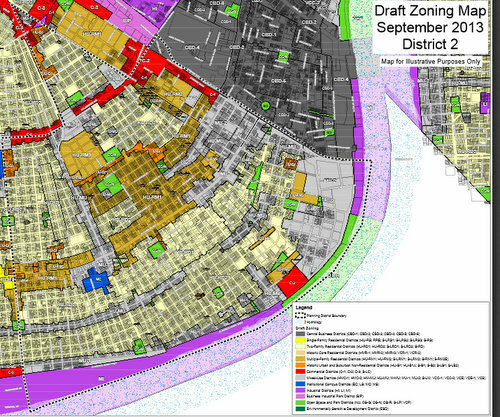 The Comprehensive Zoning Ordinance represents the enactment of the Master Plan that New Orleanians voted into law in 2008 — the Master Plan was the goals for the future of the city, and the zoning ordinance will be the laws governing those goals for each property in the city. City officials presented a first draft of the Comprehensive Zoning Ordinance in 2011, though the zoning for many areas remained partially undetermined at that time, presenting residents with a choice between two districts, for example. After receiving and evaluating more than 1,000 comments about that draft, planners made selections for each parcel in the city, and those revisions are shown in the draft of the zoning law being circulated this month. City planners are now seeking comment on the selections they made, and will collect those through Nov. 30. When that comment period is over, planners will then make any final changes needed and present a final draft to the City Council to begin the public hearing process. They hope the new ordinance can be passed into law by February of 2014. Monday’s meeting also included a question-and-answer session that covered aspects of neighborhood participation and other issues. To read our live coverage, see below. The city usually requires too much parking as it is. Any business on Magazine should not have to provide any parking. It helps promote a walkable environment which is why people come to Magazine in the first place. Car’s aren’t patronizing your businesses, people are.